#MQW (via @bnlpmc) what's the most interesting visit you've ever made? As a PA mason, every other state is like a foreign country! #MQW (via @tybaltknight) How many of y'all were in (plege or initiate) a fraternity before joining the craft? #MQW (via @jonruark) What Masonic symbol means the most to you and why? I have held back writing anything about the situation in Georgia as I had a wait-and-see attitude about what was happening down there. The main reason for this is that I was very angry and had a difficult time keeping my passions subdued. However, I have decided that now is the time to discuss the events after a cooling-off period. Here is my blanket statement, racists have no place in Lodge. Masonry is universal and seeks to make good men better. There is no mention of white, black, Protestant, Catholic, Jewish, Muslim, rich or poor. We are a great band of brothers that only looks at a man by his zeal to do good for our Fraternity. The obligation that I took involved nothing based on race, religion or any other belief except a superior belief. I would say that the non-sectarian and non-racist sentiments displayed in Masonry are the reasons I joined. I have witnessed scurrilous attacks upon people based on immutable qualities, like race or religion, and I am always appalled when it happens. I have friends that are of many faiths and many races but I did not become their friend because I wanted to look multicultural; I became friends with them because we share similar interests. In Masonry, I have always felt that meeting on the level is so important to our time in Lodge. We are all important, we all have something to give which leads me to quote three books that can be used on the altar as a VSL. Racism is a childish behavior, a behavior that one hears and sees on the playground of an elementary school. It is a behavior learned from parents and carried through to adulthood. For many years, racist comments were the norm. Now, racist beliefs are taboo. I think children have been better educated to be tolerant of others. Sadly, this was not the case for many years and those childish values remain transfixed in the mind of some in the older generations. Our society is beginning to grow up and enter adulthood. I am hopeful that some in our Fraternity will also put away childish things like racism. "O people, we created you from the same male and female, and rendered you distinct peoples and tribes, that you may recognize one another. The best among you in the sight of Allah is the most righteous. Allah is Omniscient, Cognizant." No differences should be made based on race. As each person comes from the same pair, we are to be valued as equals. The differences are only meant to serve as a way of recognition, of recognizing the great diversity of this world. Tolerance is an important value. We, each one of us, come from a different race or culture but we are all equals in the eyes of the GAOTU. We can contribute much to our global community no matter what our race, religion or culture is..
"In this world, hatred has never been defeated by hatred. Only love can overcome hatred. This is an ancient and eternal law. Brothers, hatred will continue to subside and go away in our gentle Craft only if we continue to open our hearts as long as we remember where we were first made a Mason. Continue to look forward, and continue to make us a progressive science. We may not be in the Post-Racial era but it is a good goal, perhaps the most important goal that the Craft can strive for in this decade. We will become a stronger source of light for the world, we just need to break out of old ways and old ideas. Well, it seems to be accurate. 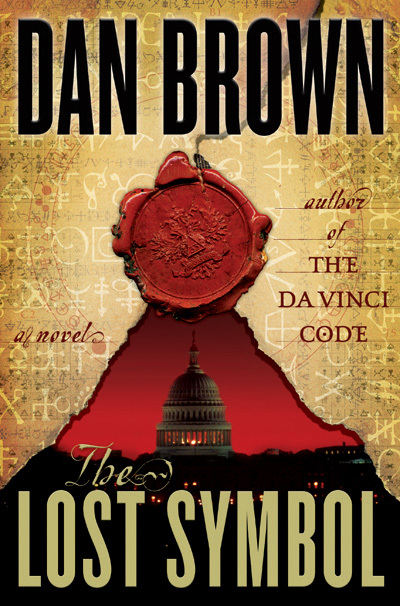 The newest Dan Brown book will indeed feature Freemasonry. The US cover features the US Capitol and the seal of the Scottish Rite of the Southern Jurisdiction. If there were any doubts before that this book would affect the Craft and how we are perceived, it should dissipate fairly quickly. What does this mean for us? First, we had better be able to explain to the millions of readers of these books any misconceptions that may appear in the book. Second, we had better be ready for the onslaught of curious men who's interest will be sparked by this book in joining our Fraternity. I know many brothers are concerned about the quality of the men that will be on our doorstep and with good reason. It will be our job to remove the wheat from the chaff. Of course, we have been doing that for centuries so we should have it down by know. And really, when was the last time you ran into a bad candidate. The UK version of the cover uses a key with a Square and Compass as its handle. It also prominently displays the US Capitol building on its face. Okay, so Esquire at the Manthanein Chronicles blog has corrected me on the SR seal. It is, in fact, more similar to the seal used by the Northern Jurisdiction. This is what I get for not being a Scottish Rite Mason. If you want to check out the analysis, go to his blog post here. So I think the Scottish Rite bodies may need to get ready for the onslaught of interest. The reason I say this is that if you add the numbers for the date, 9/15/09, equals 33. Interesting. 1st #MQW (via @nickjohnson): Does your Lodge still read the minutes? I received my copy of the Journal of the Masonic Society about two to three weeks ago (yes, I have taken that long to finish this article). As I flipped through the finely crafted magazine, I arrived at a story that shocked me. In Colorado, a Lodge and Scottish Rite Valley performed the rare ceremony known as a "Masonic Baptism". What, what, what, what?! I thought to myself, "isn't Baptism a Christian Rite and aren't we a non-sectarian group?" Oddly enough, this was not my first time hearing about this ceremony but it doesn't make me less queasy about this strange ceremony. I have a friend who described how her brother was given a "Masonic baptism" and warned me to fear those elements within the Craft. It truly creeped me out about the idea that there is some shadow element within Masonry set on giving the child to the community. At the same time, some part of me wanted to disbelieve that such a thing existed. "It can't be true." I did a few searches on Google at the time but found nothing substantial. Then this article appeared in the Journal, and my mind immediately started to hear the word, "NO" repeated several times in quick succession. I have to say that I agree with my friend on baptisms in any Masonic body. It really didn't matter to me that Pike describes a world of ritual cleansing through immersion in water in all parts of the Earth, baptism is a very particular ceremony for a very specific religious purpose. It is true that many cultures use water to cleanse and purify one's body for ritual. In Judaism, to be ritually clean, one must go through מִקְוָה, or mikvah. This ceremony has different purposes depending on what Jewish community of which you are a member. Some communities view mikvah as a means for ritual purity while other groups see mikvah as something outdated for our modern times. Islam also follows two methods of ritual cleaning, غسل or Ghusl and الوضوء or Wudu, each having a different use depending on the amount of ritual cleaning one needs as written in the Qur'an. Islam is very much a religion of both belief plus action as a way to submit to Allah. Cleansing one's self is a way to purify one's self for his devotional reverence of Allah. Hindus will immerse their bodies in the Ganges river to remove past sins and to cure illnesses. They can do this as many times as needed as a way to salvation. Many Hindus will throw the ashes of loved into the waters as a final plea for their soul. In Japan, believers in Shintoism will take part in 禊 or Misogi (which is actually more broad than water absolution) to purify their souls. I watched an episode of "No Reservations" where Anthony Bourdain was in Japan and visited a Shrine with a waterfall for absolution. The Christian ceremony of Baptism is used for a few different purposes, namely, to remove original sin (infant baptism), or as a way for an adult to be saved or to show their profession of faith in Jesus Christ. While Judaism and Islam view the use of water as a path to G-d or Allah being done as frequently as needed, baptism in Christianity is similar to a door, allowing the believer to enter into the Christian faith and community. So, after all this discussion, why do I still have a problem with the Masonic baptism? For me, it is the fact that the Masonic Baptism is focused on entering the child into the protection of the brothers just as it is used by some Christian church denominations. 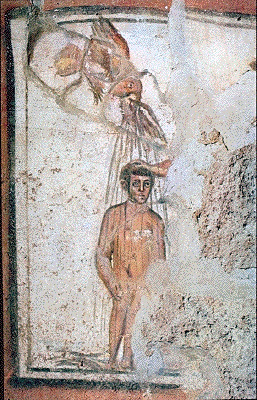 The use of the term "baptism" makes the practice immediately suspect. Also, the ceremony is done by another unlike other ritual cleansings in different cultures which are done by a single worshipper. What is the purpose of the immersion of the child? I believe that it is because the child is being entered into a specific faith community, which is a big no-no. Albert Pike's assertion is just plain wrong that this is just a ritual involving immersion of water found in all cultures and societies, it is more than that. The ritual is not repeated nor is it used to cleanse the child. It is being used as a way to initiate the child into a Masonic quasi-religious community. Another problem is the idea of an non-clergy person performing a rite reserved for the clergy. It is true that Masonry has the office of Chaplain which can be held by a non-clergyman, however, the chaplain leads the brethren in prays determined in advance without a sectarian message. Baptisms are a specific rite are done only by a clergyman. When a non-clergyman performs the baptism, the rite is reduced in significance as well as possibly violating a certain Christian sect's rules on rites being performed by non-clergy. My final thought: it is always interesting to see what add-ons are within Masonry but there are times when the line is crossed. In my mind, to engaged in a Masonic baptism is to cross a line drawn in concrete. The ritual cleaning of the child is only done once and it is used to have the child enter the community of Masonry, this smacks of a Christian rite. It is the mixture of sectarian belief in a non-sectarian organization and should be avoided. McClenachan, Charles T., The Book of the Ancient and Accepted Scottish Rite of Freemasonry. New York: Masonic Publishing and Manufacturing Co., 1868.